This page is something of a chronology of the Star Wars saga's tumultuous relationship with DVD. As my friends will tell you, I've been a Star Wars fan for many years. One of the reasons I wanted to get a DVD player was to be able to see the original trilogy with the best video and audio I could get. I got into DVD when the format had been out for just over a year and a half, and there were still fairly few "catalog" titles (older movies) available. Many of the early adopters were keenly interested in having their favorite movies released on DVD. Of all those sought-after titles, only a few remain MIA. Sadly, the original Star Wars trilogy sat at or near the top of that much-diminished list for almost seven and a half years. Some might even say that it still sits there, as the original theatrical versions of the films are still not available. So how did this page get started? After a couple years of rumor and supposition, Lucas remarked in a radio interview that he was going to wait to release any of the movies on DVD until he could do a fancy, feature-laden, groundbreaking six-disc box set. He wanted to oversee the whole process, which meant he expected to wait until after Episode III was done to put any of the movies on DVD. Not surprisingly, I was not the only person who found waiting until 2005 or 2006 for Star Wars on DVD to be a bit upsetting. As the reality of a wait of (at that time) five or six years started to sink in, many people began asking why LucasFilm and THX couldn't put together high-quality anamorphic transfers and Dolby Digital 5.1 soundtracks for the original trilogy and Phantom Menace (which appeared on VHS in the spring of 2000 and even on LaserDisc in some overseas markets) and sell the hell out of some movie-only DVD's. Then Lucas could oversee the creation of a giant six-movie special edition boxed set after he finished with Episode III. (Seriously, how many Star Wars fans do you know with multiple copies of the original trilogy on VHS? Most of them...) The result was an online petition, which is about the time that I got into the act with this page (the page has subsequently split into several pages: this news page, a review page, and a collection of DVD cover art). I keep the latest news item(s) near the top of the page. For the entire convoluted history of what came before, start here and work your way on down. With the arrival of the last movie (Revenge of the Sith) on DVD on November 1, 2005 and the looming HD optical disc format war (Blu-ray vs. HD-DVD) waiting to begin in earnest in 2006, I've made a format change to the site. In addition to the date at the start of each entry I'm adding a note that will identify whether the entry includes information about the movies themselves, DVD, Blu-ray, or HD-DVD. The indicators are (Movies), (DVD), (Blu-ray), and (HD-DVD). There are several often-discussed scenes in there, including the making of Luke's saber and the return to the Falcon after escaping Jabba's palace in Return of the Jedi and a scene on Hoth from The Empire Strikes Back that is likely part of the scene in which a wampa breaks into the rebel base. Finally, iPad owners can check out a free app that provides a preview of some of the bonus content from the Blu-ray set, mostly image gallery stuff. iPhone and iPod Touch owners will need to keep waiting, though. Needless to say, interest was high. The involvement of Panasonic in the announcement led some to expect a 3D tie-in, but that was not to be the case. Instead, there will be three separate releases in September 2011. The specific release date will be announced later. Star Wars: The Complete Saga will have all six movies on Blu-ray in a nine disc set, with a retail price of $139.99 (already available for pre-order from Amazon.com for $89.99). Star Wars: Prequel Trilogy will have the three prequel films on Blu-ray in a three-disc set, with a retail price of $69.99. 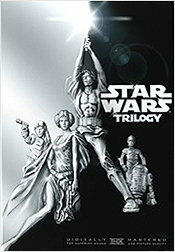 Star Wars: Original Trilogy will have all three original films on Blu-ray in a three-disc set, with a retail price of $69.99. There is also a 90-second teaser trailer for the Blu-ray release available at Starwars.com with clips from all six movies, but there's no additional information in it. The Complete Saga's three bonus discs will contain 30 hours of special feature content, including some never-before-seen deleted and alternate scenes, a look inside the Star Wars archives, and more. All of the movie discs will be BD50's with bit rates as high as 40mbps. Audio format has not been specified, but I suspect it will be Dolby TrueHD (possibly even 6.1 or 7.1 TrueHD) based on LucasFilm's history with Dolby Labs. Oh, and it looks like the original trilogy will be the most recent incarnation of the "Special Edition" edits. There's no sign of the original theatrical cuts. Consumers had been patiently (and impatiently) waiting for some official word on the release of Star Wars on DVD since the format was launched in March 1997, two years before Phantom Menace hit theaters. 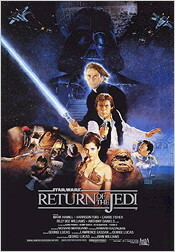 The 1997 theatrical Special Edition release of the original trilogy came right around the time the DVD format was launched, but later that year the restored and revised movies were made available on VHS and LaserDisc only. In July of 1999, Lucas told a British morning radio show that he wanted to wait until Episode III was finished before releasing any of the movies on DVD, so that he would have time to produce fancy special editions of all six movies. Rick McCallum once said that Lucas was planning to wait for Dolby Digital EX processors to become available in homes (Dolby began licensing Dolby EX processing in November 2001, by the way, although the THX Surround EX processing that is closely related to Dolby EX had already been available for a year or two at that point). When the time came for Phantom Menace to be released, there were hints that a DVD might hit shelves at the same time as the VHS version did. Alas, it was not to be: pan-and-scan and widescreen versions of Phantom Menace appeared worldwide on April 4, 2000, along with a Japanese widescreen LaserDisc release. On January 24, 2000, shortly before the release of Phantom Menace on VHS, Digital Bits, dvdfile.com, and Digital Man Interactive put together an open letter to George Lucas and an online petition requesting a DVD release of the movies. At the same time, Digital Bits cooked up a number of little messages to Lucas (DVD Does Matter, May The Bootleg Be With You?, and Got DVD?. After the huge response to the petition mentioned above and some reports online of the widespread appearance of bootleg DVD's of all four movies (mastered from the high-quality LaserDisc trilogy Special Edition releases from 1997 and the 2000 Japanese LaserDisc of Phantom Menace), there was some activity on Lucasfilm's part that hinted at preparing the Star Wars movies for release on DVD. 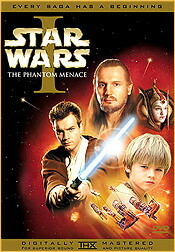 Rumors put the release of The Phantom Menace on DVD around late 2001 (only a year and a half after the VHS). Specifically, Digital Bits began reporting that the release date for The Phantom Menace would be October 16, 2001 and that it would be a 2-disc special edition. The original trilogy won't appear until 2002 at the earliest. Most recently, Digital Bits reported (near the bottom of the page, with the main announcement in yellow text) that the movies will be released as special editions at the rate of one disc per year, until all six movies are out in 2006. More recent information suggests that Lucas still plans to hold off on releasing the original trilogy on DVD until after Episode III is complete. Makes it hard to resist the bootlegs, especially after actually seeing some of them. For those of you craving the movies on DVD now, your only choice remains to turn to eBay or elsewhere on the Internet and search for Star Wars DVD. June 19, 2001 (DVD): On June 19, 2001, The Digital Bits reported that their Rumor Mill reports were correct, and Lucasfilm had officially announced that Star Wars: Episode I - The Phantom Menace would be arriving on DVD on October 16, 2001, as a two-disc set (THX mastered, of course) with anamorphic widescreen, Dolby Surround EX (and Dolby 2.0 in English, Spanish, and French), and absolutely loaded with extras (close to four hours of extra materials). Both Digital Bits and DVDFile.com reported this early on June 19. For details on the announcement, you can see the reports from both sites -- Digital Bits and DVDFile.com. Below is an overview of what will be in the two-disc set, which was quickly available for pre-order on Amazon.com. Audio commentary by writer-directory George Lucas; producer Rick McCallum; co-editor and sound designer Ben Burtt; visual effects supervisors Scott Squires, John Knoll and Dennus Muren; and animation supervisor Rob Coleman. Seven deleted scenes (all with the special effects completed by ILM specifically for the DVD release). Documentary "The Beginning" -- an hour-long documentary created for the DVD from 600+ hours of footage offering a look inside Lucasfilm and ILM during the making of the movie. Multi-angle storyboard to animatic to finished film feature, that lets you flip through the various phases of development of key action sequences. Five behind-the-scenes featurettes looking at Phantom Menace's storyline, designs, costumes, visual effects, and fight scenes. The "Duel of the Fates" music video. All 12 parts of the Lynne's Diaries (web documentaries that originally appeared on starwars.com). Galleries of theatrical posters, print campaign, and never-before-seen production photos. July 12, 2001 (DVD): It's not much to tide us over to October 16, but Theforce.net got their hands on a commercial for the upcoming DVD release of Episode 1: The Phantom Menace. You'll need Quicktime or the divx codec to view the ad, which includes some glimpses at what will be included on the two-disc set. Also, Amazon.com and other online retailers have been taking pre-orders for a couple of weeks now -- it's been the top-selling DVD on Amazon.com almost constantly since the first day it became available. Episode II has a title -- Attack of the Clones. September 7, 2001 (DVD): At the unveiling of the Phantom Menace DVD on September 6 and 7, 2001, there was a little more news about the remaining Star Wars movies. At the moment, we should expect to see a DVD release of Episode II (Attack of the Clones, in case you haven't heard) probably in time for Christmas 2002. After that, though, it may get a little sparse -- Lucas appears to be planning to hold off on addressing the original trilogy until after Episode III hits theaters. It sounds like Episode III will arrive on DVD in late 2005 (six months or so after the theatrical release), with the original trilogy arriving on DVD the following year (2006). At the press event on September 6 and 7, review copies of the disc were released to a number of web sites; they were allowed to post their reviews and reports from the unveiling at 12:01 AM Pacific Time on September 11 (the reports were understandably almost immediately overshadowed by real-world events later that morning). September 11, 2001 (DVD): The Episode I disc has been unveiled to select members of the press, mainly web sites that cover Star Wars or DVD. At 12:01 AM Pacific Time on September 11, 2001, the sites began posting their reviews, so there's a lot of information available. For two of the reports, try Digital Bits and DVDFile. The disc sounds excellent. There's reportedly a little film grain in the transfer (not really objectionable), as well as some edge enhancement (which is sort of a pity). The audio track is supposed to be absolute reference material. And we can expect Episode II on DVD next year, day and date (or close to it) with the VHS. Unfortunately, after that we shouldn't expect any more until after Episode III; Lucas wants to wait to do the original trilogy until then to take special care of them (and maybe add more to them? ), so they probably won't appear until around 2006. October 2001 (DVD): Since Episode I appeared on DVD on October 16, 2001, it has become a popular demo disc, particularly for showing off home theater surround sound systems. There are several reviews of it available online, including the reviews at The Digital Bits, DVDFile, DVD Angle, and even my review here. 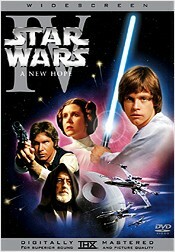 February 19, 2002 (DVD): (links fixed May 13, 2002; added link to local mirror May 20, 2002) For anyone with copies of the Star Wars DVD's, you might want to check out DVD CoverArt  they have some actually good DVD covers for Star Wars (including A New Hope, Empire Strikes Back, and Return of the Jedi Special Edition and the original A New Hope, Empire Strikes Back, and Return of the Jedi) and two versions of a cover for Phantom Menace (one the original resized for a double Alpha keepcase and another with a different cover available for single width and double width keepcases). I've got a local mirror of these covers available here. May 3, 2002 (Movies): We're starting to get Attack of the Clones news in -- there are at least three reviews online right now (the Harry Knowles/AICN early review from March 17, Peter Tribeman's review in the Outlaw Saloon, and Ron Epstein's review from Home Theater Forum). In more DVD-related news, The Digital Bits reported in their Rumor Mill on May 1 that Lucas plans to release AotC on DVD in October or November of this year. May 20, 2002 (DVD): Just a brief note here, The Digital Bits has a report in the Rumor Mill today with several possible DVD release dates -- including Attack of the Clones on November 26, 2002 (as well as Spider-Man on 11/5 and Men in Black II on 11/19). May 17, 2002 (DVD): Below is a news item from May 16 at The Digital Bits that should be good news for everyone who has caught Attack of the Clones in the theater and wants to see it at home (it also re-confirms Lucas's plan to sit on DVD's of Episodes IV-VI until 2006 or so). 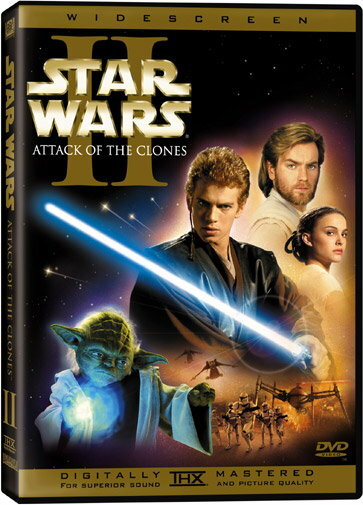 Given that today marks the debut of the all-digital Star Wars: Episode II - Attack of the Clones in theaters, we thought it only appropriate to give you all a rundown of the Star Wars DVD situation. There are many "new" reports appearing in the press about this (stirred up for obvious reasons), but there's no real news to be found. At least nothing those of you who have been following the subject forever don't already know. But for the rest of you, the basic story is this. Elements of the Episode II DVD have already been in production for many months. The DVD will be a 2-disc release, patterned very closely after the recent Episode I DVD. That means you can expect the film in anamorphic widescreen video on Disc One, along with Dolby Digital 5.1 EX surround sound and THX-certification. Word is Lucas and company are also planning another trip to the audio commentary booth for the DVD. Disc Two is likely to feature another "behind-the-scenes" documentary (we confirmed during our trip to Skywalker Ranch last year that one was being created), along with a number of deleted scenes completed for the release, trailers and TV spots, the Episode II web documentaries and more. The title IS expected to be released later this year, probably in October or November (latest word is you'll have it before Thanksgiving). Lucasfilm has also basically suggested that it's likely Episode III will be released on DVD without delay after that film appears in theaters in 2005. As for the original Star Wars films, Lucas has himself confirmed that he's filmed additional scenes (during the production of these prequels) that he intends to add into Star Wars, The Empire Strikes Back and Return of the Jedi to "complete the Saga the way he always envisioned it". He's also expected to enhance and/or replace more special effects sequences with CGI and make other refinements to the original films. These "ultimate" versions are what will eventually find their way to DVD (there's no word as to whether or not he'll also include the unaltered theatrical versions - those of us who grew up with them certainly hope so). Lucas has also stated recently that he and his crew didn't create as much "making of" material during the production of the original trilogy, so it will take time to compile new material for the eventual DVD release. And while he's working on the prequels, time is something he doesn't have a lot of. What that means, is that you shouldn't expect the original films to appear on DVD until sometime after the release of Episode III in 2005. And that is, more or less, the best and most up-to-date information available on the subject of the Star Wars films on DVD. We'll be sure to keep you appraised as the production of the Episode II disc continues. You can reasonably expect official details to begin appearing from Lucasfilm later this summer. Cheer up - with a little luck we might get the Indiana Jones films on DVD in the meantime. Maybe Raiders next year? Paramount? You hearing us? August 1, 2002 (DVD): There have been rumors for some time now (even one liner note sheet that was supposedly leaked from Lucasfilm) about a release date for the Episode II DVD, but this morning The Digital Bits reported the official announcement of that disc. Star Wars: Episode II - Attack of the Clones will arrive on DVD in both anamorphic widescreen and full frame editions on November 12, 2002. Suggested retail price is $29.98, and pre-orders will begin on August 14. The video is being transferred directly from the digital source, and there will of course be a Dolby Digital EX soundtrack. Below are a picture of the widescreen edition and a feature list. It's going to be an expensive fall for DVD fans, with this disc arriving on the same day as the 4-disc release of Fellowship of the Rings and a number of other titles due or expected in November (Band of Brothers on November 5, Spider-Man and Men in Black II rumored for the 5th and 19th respectively, and another season of The X-Files just to name a few). September 9, 2002 (DVD): A few copies of the first (movie) disc of Episode II have somehow leaked out. (Snuck out of the mastering facility? Selectively released by Lucasfilm in a manner similar to the VHS screener seen by Harry Knowles a year or so ago? Not sure, but it appears to be the real deal.) The second disc (with the bulk of the extra material) was not included. Check out this review of the Attack of the Clones DVD. It'll hit stores on November 12, as previously announced. UPDATE: Word from The Digital Bits on September 10 indicates that the at least a few copies of the first disc have "walked" out of the replication plant, been copied, and started appearing for sale online and in parts of Asia. Unlike the real disc, these are DVD-5 discs (single layer, single sided), with only the English Dolby Digital EX and commentary audio tracks. The bootleggers obviously did some squeezing and additional compression to get the two-plus hours of video to fit onto a single layer, which will show up on the screen as a loss of picture quality. I don't know if the disc reviewed by Lights Out Entertainment was a dual-layer original or a single-layer bootleg. With the real thing shipping in two months, I don't see how much appeal an over-compressed movie-only version really has, but oh well. September 11, 2002 (DVD): Anyone interested in a preview trailer for the Episode II DVD? If so, click here for the trailer in Windows Media Video format. If you have troubles there or would prefer to save it to your hard drive rather than stream it, I've got a mirror up here (right-click and select "save target as..."). It's about four minutes long and includes some clips from all five movies as well as a summary of the contents of the Episode II disc. September 16, 2002 (DVD): More and more news coming out on the Attack of the Clones DVD, and it's still almost two months away. The disc features have already been announced, including mention of eight deleted scenes. The specific nature of those scenes is still being revealed, though. As it stands, five scenes have reportedly been confirmed, and three more are still rumors. Here's the list, but note that scenes 3, 7, and 8 (the scenes that are still "rumored") may not be right. I don't know about you, but I'm starting to really look forward to this disc. September 25, 2002 (DVD): We've got the final list of deleted scenes that will appear on the second disc of Attack of the Clones this November 12. Unfortunately the rumored Yoda/Dooku and Jedi raid scenes aren't there. There will be short intros available for each scene where Lucas, Rick McCallum, and Ben Burtt will explain why they cut the scene. See this article at Starwars.com for the full run-down on the deleted scenes announcement. October 9, 2002 (DVD): Well, it's just over one month until Episode II arrives on DVD. That means it's time for the DVD news sites to start getting review copies in hand and providing us with some feedback. Sure enough, the reviews are starting to come in. Bill Hunt at The Digital Bits has posted his very positive review, Peter Bracke of dvdfile.com has posted his review (yes, he does find room for some patented Bracke negativity), and I expect a few more will be appearing in the next day or so. From all indications, the audio and video are excellent. The edge enhancement that some reviewers noted on Episode I is nowhere to be found. I'll keep my eye out for more reviews and add them here. While we wait for the real thing to hit shelves, these reviews and the DVD preview video are all we have. October 15, 2002 (DVD): I found one more review of the upcoming Episode II DVD. It was posted yesterday at AICN by Harry Lime, the same AICN staffer who attended last year's Episode I DVD unveiling (and reported on that event here). December 20, 2002 (DVD): Not much new in the way of Star Wars DVD news, although there have been some indications that Indiana Jones may arrive on DVD late in 2003. I did want to note here that I have added a brief review of the Episode II DVD to my review page, and I have added a few covers to the cover art page (the Five Star covers and a custom cover for Episode II). DVD Cover Art just returned to the net in the last day or two after a months-long haitus, but I will leave my cover art page up since it seems to have been convenient for people lately. I also got a question recently about chapter lists for the Five Star DVD's. I have not seen them anywhere on the web, but I may take some time over the holidays and try to compile a list of them. I may even try to cook up keepcase insert pages for each disc, depending on how the holidays and work decide to treat me. December 25, 2002 (DVD): Brief note this evening: I've added inserts for the Five Star discs (one set that matches the standard gold Five Star cover art and another set that matches the black cover art) that include a chapter list for each disc to my Star Wars DVD cover art page. The inserts will probably be appearing on DVD Cover Art at some point, but since they just re-launched the site this month they've been swamped with new art submissions, so it may be a while. February 7, 2003 (DVD): It's appeared in several news items around the 'net today (here, for example), and it seem very relevent to this page's purpose. Lucas spoke last night at the opening night of an ILM/Skywalker Sound tribute at the Egyptian Theater. Among the items discussed was the fate of an eventual DVD release for the original trilogy. Lucas stated, apparently in no uncertain terms, that the original 1997/1980/1983 versions of the trilogy will not be appearing on DVD. Ever. The DVD's (when they finally arrive, probably still around 2006) will be the 1997 special edition versions of the movies. Personally, I'm not particularly shocked by this; back in '97, Lucas pretty much said "these are now the 'real' version of these movies, forget the old stuff.'" It's a bit disappointing, and it has infuriated a lot of people who disliked the changes made in the SE's (including Bill Hunt of The Digital Bits), but it looks like that's the way it is going to be. Few science fiction films have achieved the success and notoriety of the original Star Wars trilogy. Loved and cherished by millions of devoted fans, Star Wars encompasses a universe full of heroes and villains that continues to endure in popular culture. 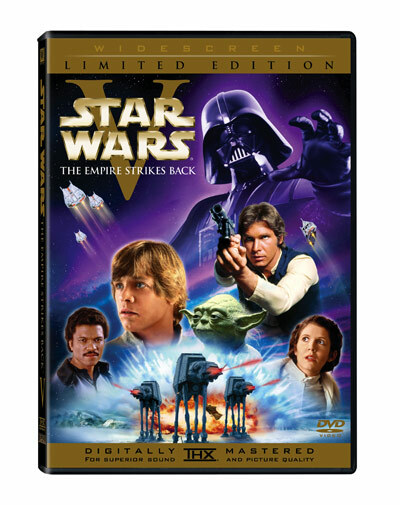 Currently, you have no plans to release the original theatrical cuts of Episodes IV, V, and VI on DVD. To be replaced by completed versions of your Special Editions released in 1997, these classic pieces of science fiction and film history should not be allowed to fade away into obscurity. Without getting into the debate over whether these updates to the original trilogy are good or bad, it seems a shame that the fans, who have collectively spent hundreds of millions of dollars over the last 25 years purchasing Star Wars movie tickets, video cassettes, laserdiscs, action figures, and various other memorabilia, will not be able to own DVD-quality versions of the original Oscar-winning films that captivated them so fully for so many years. We, the undersigned, urge you to reconsider your position on the matter and release the theatrical cuts of the original trilogy on DVD--and someday, HD-DVD--untouched and unaltered. We fully appreciate your desire to improve upon your original work; all we ask is the option to enjoy the brilliance of the original trilogy as it was when we first came to know it. Lucas has said several times that he considers the original theatrical versions to be gone forever, which has always saddened me somewhat and makes me skeptical about the chances of him giving in on this issue. He also originally intended to wait until 2006 to release any of the Star Wars movies on DVD, however, until an online petition and uproar from the fans convinced him to at least release the new movies. Since much of the restoration effort done to the original trilogy in the mid-90's focused on the Special Edition versions, it may take Lucasfilm (and THX) some work to get good prints of the original theatrical releases together, so even if it does happen, Special Edition DVD's may be ready first. March 10, 2003 (DVD): OriginalTrilogy.com has gone live, and in the process replaced their old petition with a new petition (you can see the signatures here) as well as a forum. The original petition was abandoned due to immature and irresponsible comments that Jay Sylvester (OriginalTrilogy.com's webmaster) understandably believed undermined the purpose of the petition. The new petition is hosted at OT.com and is simply a list of names attached to the site's letter to Lucas (which is an expanded version of the original petition. I signed the petition this morning because I feel that the original trilogy are an important part of our history -- even if they are not the best movies of all time, they hold a valuable place in our culture. It would be a shame to see the original form of the movies disappear forever, which they very likely will if Lucasfilm and Fox do not take some effort in the next few years to preserve them. The 1996-1997 restoration took care of a huge amount of that preservation work. It would be good to see Lucasfilm take that last extra step and produce a restored digital master of the original trilogy (which they could then even put on a DVD and sell! ), and even though I'm not very optimistic that this will happen I will at least cast my vote in favor of it. March 19, 2003 (DVD): It's been a busy week or so for OriginalTrilogy.com -- they've gotten some pretty heavy support from Digital Bits, Home Theater Forum, and several other sites starting on Monday. Word has spread pretty fast; the petition had collected about 3,000 signatures in the first week it was up, and then added about 7,000 more in 24 hours. I figured that I'd go ahead and add OriginalTrilogy.com's banner to my site, both here and on my main Star Wars DVD page. September 17, 2003 (DVD): OK, so Indiana Jones is due on DVD in a four-disc set in little more than a month (after years of waiting). What's the logical next step? A four-disc set of the original Star Wars Trilogy -- one disc per movie, plus a fourth disc of bonus material. Too logical? After all, it's been over six years since the DVD format was launched, and Lucas has spent those six years swearing up and down that it'll be 2005 or 2006 before the trilogy will land on DVD (in their Special Edition form only; Lucas has shown no signs of changing his stance on that issue). And yet The Digital Bits has an item in the Rumor Mill today indicating that there may be plans to use the Indiana Jones four-disc format, which Lucasfilm is reportedly very pleased with, to release the original trilogy on DVD in the fourth quarter of 2004. There's even this BBC article reporting (near the bottom) that the Universal-owned UK distributor Channel.com is listing the trilogy for release in Q4 2004. The Bits is still digging into it, but I suspect it'll be months before anything official creeps out. Two possible reasons for Lucasfilm to do this come to mind. First, it's an excellent way to stir up some more publicity for Episode III, coming in 2005 (much like the DVD release of Phantom Menace arrived in fall 2001, followed by Attack of the Clones in 2002). Think of people sitting on their couches for eleven or twelve hour movie marathons of A New Hope, Empire Strikes Back, Return of the Jedi, Phantom Menace, and Attack of the Clones in May 2005 before going off to see the last installment at the theater. Second, this is the first year since 2000 in which Lucasfilm hasn't put out a Star Wars DVD during the fourth quarter. Indiana Jones probably fills that void pretty nicely, and they can look forward to Episode III in 2005, but Q4 2004 would be a complete DVD non-event for them without the original trilogy. Obviously, this rumor is still little more than speculation, but we'll keep an eye out for more information. October 31, 2003 (DVD): Just to add to the fun, here's a follow-up article on AICN -- a second audience member writing in with a different recollection of the screening. The changes to the sabers did include some improved color in places, but there were still remnants of the original rotoscoping. It sounds like this print was only subtly different from the SE video tapes. We'll just have to wait and see what (if anything) happens next fall. November 6, 2003: (DVD) It's no longer really a surprise after last month's hints, but it is now a bit closer to official. Lucasfilm held a meeting yesterday with their retail partners, and the news coming back from that meeting includes several planned DVD releases. First, the animated series of Clone Wars shorts (which will shown on Cartoon Network soon) will be released on DVD, possibly as soon as the end of this year. The teaser campaign for Episode III will begin in January 2005, leading up to the May 2005 theatrical release and a DVD release in November 2005. 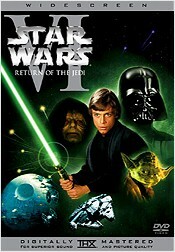 Best of all, Lucasfilm will release the original trilogy on DVD in September 2004. This has not been publicly announced by Lucasfilm yet, but based on what's being reported at AICN and Digital Bits, it is just a matter of time before it becomes official. November 11, 2003 (DVD): I came across a news tidbit this morning regarding Phantom Menace and Attack of the Clones  in a somewhat Disney-esque move, Fox and Lucasfilm will apparently be placing the DVD's of both movies on an indefinite moratorium as of December 31, 2003. Presumably they will reappear in 2005 or 2006 in a box set with Episode III, perhaps alongside the original trilogy (which will likely end up sporting a few extra scenes here and there, as Lucas has said a few times that he's shot some scenes in recent years for inclusion in the original trilogy to help tie them more closely to the prequel trilogy). It's possible that they'll return to shelves when the trilogy four-disc set appears in September 2004, but that seems like too brief a moratorium to be worth worrying with. November 20, 2003 (Movies)/(DVD): The rumors continue regarding the original trilogy -- this is the sixth news update in two months. A note in the Rumor Mill at Digital Bits today reports that work is in progress to further edit and add to the trilogy (new special effects, revised and updated shots and scenes, and even some new footage), possibly in order to include the changes for the September 2004 DVD release that still appears probable. Changes include additional footage involving Ian McDiarmid (Emperor Palpatine) and Hayden Christensen (Anakin) -- including an "aged" Hayden revealed at the end of Return of the Jedi when Vader is unmasked during Luke's escape from the second Death Star. Other changes specifically mentioned include the restoration of the original sequence of events surrounding Greedo's death in the cantina (Han shooting first) and some adjustments to the duel between Vader and Obi-Wan at the end of A New Hope. Digital Bits' sources are reportedly reliable, originating inside Lucasfilm. There's no word if these latest changes will be completed by September 2004, or if the 2004 discs will represent the "Special Edition" form of the movies with a later set of "Ultimate Edition" or "Really Special Edition" discs in 2005 or 2006 after Episode III is released. 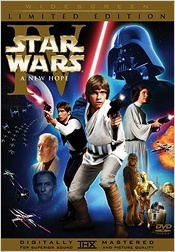 December 9, 2003 (DVD): The latest news on DVD's of Episodes IV, V, and VI comes from The Force.net. Specifically, they are reporting that sources inside Fox have told them to expect all three movies to be released on November 4, 2004, as separate releases -- not in the box set that was previously rumored. The box set may still be offered in addition to the individual discs. Prices are not expected to be announced until around August. January 30, 2004 (DVD): And the hints keep comin'. There's a report from Rebelscum.com about a private presentation by TLC Marketing plc to British toy industry insiders. Specifically, along with an assortment of toy-related news items, TLC repeated the announcement that LucasFilm will release Special Edition DVD's of Episodes IV, V, and VI in October or November of 2004. That matches well with the string of hints we've been hearing for the past several months, including the report from back in December that suggested November 4 as the specific release date. Still no comment at all from LucasFilm or Fox about the seemingly endless stream of rumors and leaks about the fall release of the trilogy, but based on past disc announcements (Episode I and Episode II were officially announced three to six months before release, and the Indiana Jones set was announced about six months in advance) they should go public some time between May and July. Considering the fact that we've already had four months of rumors, it's likely to be closer to May than July. February 5, 2004 (DVD): In an interesting follow-up to Monday's news... Separate but almost identical reports from two sources today (TheForce.net and Rebel Scum) suggest that next Tuesday (2/10) will bring an official announcement from LucasFilm regarding the trilogy on DVD. If their information is accurate, the trilogy will be arriving as a four-disc set (like the Indiana Jones set released last year) on September 21, 2004. No word yet on the specific features. February 10, 2004 (DVD): It's only been five months since the first rumors hit, but it is now official. 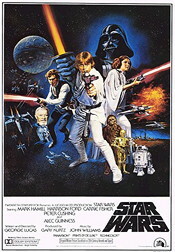 LucasFilm will release the original trilogy on DVD in the US and Canada as a four-disc set on September 21, 2004, with an international release to follow. The movies will not be available separately. As indicated in the release (quoted below), the trilogy is being restored and re-mastered by THX and will include Dolby Digital EX soundtracks. There is no mention of widescreen options, but based on previous releases from LucasFilm (Episodes I and II and Indiana Jones) they will presumably offer both pan & scan and anamorphic widescreen versions. There is also no mention of the specific versions of the movies to be included. It seems certain that the original theatrical cuts will not be in this release (and likely not in any future official release), but whether it will be the 1997 Special Edition versions or versions with additional updates is not yet know. There have been rumors in recent months that Lucas has been re-visiting the 1997 cuts and making a few more tweaks  restoring the Han/Greedo shootout to its proper structure, for example  and it is likely that such edits (if real) will appear on these DVD's. When more specs are announced, I'll post them here. 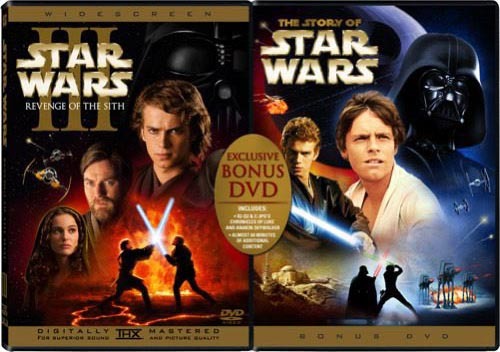 February 10, 2004, continued (DVD): In a follow-up to this morning's press release, The Digital Bits contacted LucasFilm's Jim Ward and picked his brain a bit about the trilogy DVD's. They reported that the following features had been definitely established: four disc set, anamorphic widescreen (pan & scan is still under consideration), Dolby Digital 5.1 (EX is under consideration; since it was listed in the press release and since Episodes I and II included it, I'm guessing they'll end up including EX), commentaries with Lucas and other crew (specific participants to be determined), English, French, and Spanish subtitles, and closed captioning. The movies will be the 1997 Special Editions (no word on any possible additional revisions). Lowry Digital (the company responsible for the video work on the Indiana Jones DVD's) is involved in the remastering for the trilogy, handling digital restoration and clean-up work. The core feature of the bonus disc will be a new feature-length documentary, including some never-before-seen footage. Price has not yet been determined. Obviously with seven months until the street date, there's a lot of work left to do, and the complete, official feature list likely won't appear until this summer. February 12, 2004 (DVD): It's been a busy week for Star Wars DVD news, with all the uproar around LucasFilm's announcement. September 21 will likely be unusually slow getting here for some people, and the seven months between now and then will likely be filled with energetic debate over the trilogy and Lucas's changes to them. In anticipation of that (and apparently in response to a torrent of e-mail), Bill Hunt of The Digital Bits has written an excellent editorial on the subject: Well... Here We Go Again: Star Wars on DVD. He discusses the likelihood of changes to the 1997 Special Edition sprinkled through the DVD's and offers what I think is a very realistic opinion about the chances of seeing the original theatrical cuts on DVD (or some other optical format, like HD-DVD). Like me, Hunt doubts that any amount of fan furor will cause Lucas to release the original theatrical cuts again. Lucas will have to finish Episode III, put it on DVD, and retreat to Skywalker Ranch for a while. (He also remarks that he might be OK with the SE's if Han shot first, the CGI Jabba was fixed, and the sabers in Ben's final duel received a little attention -- a set of "high irritation" revisions that closely match my own list.) Hunt does hint that Lucas already has plans to continue to refine the movies after 2005 (a rumor that has existed for several years now), which would likely culminate in an "Ultimate Edition" somewhere around the 30th anniversary in 2007. That edition is a likely candidate for release on HD-DVD, which the industry hopes to launch by 2006. Give Bill's article a read -- it's good stuff. February 18, 2004 (DVD): Work's been pretty hectic lately, but I wanted to pop through here and make another brief update. First, there's word that there will be "exclusive cut scenes" on the new discs according to the French press release announcing the DVD's. The news that struck me as more significant was The Digital Bits' report that Carrie Fisher has reportedly announced that she will be involved in audio commentary or commentaries. A cast commentary (Fisher, Hamill, Ford, and perhaps some others like Anthony Daniels, Billy Dee Williams, Kenny Baker, and Peter Mayhew) would be extremely cool. 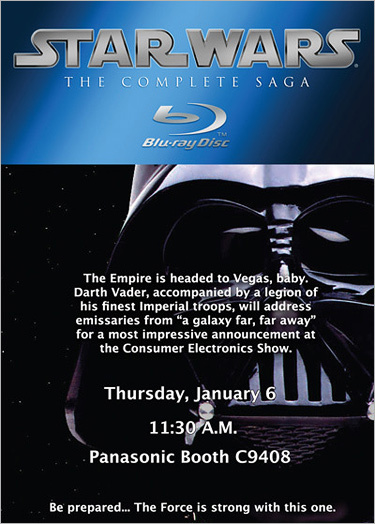 February 24, 2004 (DVD): The official announcement of the Star Wars DVD's continues to generate activity, making it clear that the next seven months will be long months. Some of the more recent examples include this most recent Jar-Jar joke (in case you hadn't seen one this week) and another editorial asking for the original theatrical releases on DVD. Neither break any new ground, but they do seem like good examples of the debate that Lucasfilm (and the rest of us) can expect to see bouncing around the net for the next seven months. March 1, 2004 (DVD): There are obviously countless questions about the trilogy DVD's that remain unanswered -- what extra features will be included, who will be involved in the commentaries, what will the menus look like (Van Ling is reportedly back to take care of the menus for us, so that should turn out well), and even what will the packaging look like? Well, we've gotten an unintentional peek as some possibilities for the packaging, at least. For some reason, the folks at Neuron Syndicate posted three proposed designs to their web site over the weekend, and although they promptly pulled them down there were a number of people who saved copies while the images were up. Copies are posted at a French news site among other places. All three proposed designs differ from both the existing Episode I and II covers and the keepcases-in-box design of the Indiana Jones set. The three designs are "The Final Conflict" (a black design with silver lettering and Vader's mask on the front), "Jedi vs. Dark Side" (black with silver lettering again, with a blue saber on the spine, green highlighted images of Yoda on the outer front and Luke with a green saber on the inner front, and red highlighted images of Vader's mask on the outer back and Vader with his red saber on the inner back), and "The Imperial Collection" (a complex looking set of sleeves, again using a color scheme of black with silver lettering, with Vader's mask on the outer spine, the second Death Star on the inner spine, the lower hull of a Star Destroyer on the back, and some sort of slip cases in the innermost sleeve). I've mirrored the images here, but I doubt any of these will end up on store shelves this September. Hopefully they will settle on a design that is at least similar to the existing cases, although since they've put both Episode I and II on moratorium it's very possible that they will abandon the cover style from those discs. After looking at them for a while, I'm beginning to think that I might not mind either "The Final Conflict" or "Jedi vs. Dark Side" box designs, particularly if they housed four standard keepcases (like the Indiana Jones set). These designs seem to suggest that Lucasfilm is leaning toward a Digipak design of some sort, however, which makes me suspect that this set will generate a lot of interest in fan-produced cover art sets for individual keepcases and covers for three-disc or four-disc keepcases (similar to the scores of covers created for the Lord of the Rings Extended Edition four-disc sets). March 2, 2004 (DVD): In case anyone was wondering, Digital Bits has confirmed with some of their sources that the trio of sample cover art images released over the weekend are just concepts still, and that nothing had been decided yet about the packaging that will be used in September. March 5, 2004 (DVD): FYI  the trilogy DVD set will reportedly be available for pre-order beginning on March 20. No word yet on what the pricing will be or if there will be more specifics on features or packaging. I spoke with Ben Burtt recently. He mentioned the upcoming Star Wars DVDs. It seems that they were able to go back and digitize all of the original tracks and rebuild the show from scratch. For the previous Theatrical Special Editions they were only able to go back and re-mix and edit from the pre-mixes which were sonically limited by the analogue recording and reproduction systems of the time. Since Ben was responsible for archiving all of the sound on A New Hope, all of the sounds were able to be found except for a couple of foley tracks which I'm assuming will be re-done. So it seems that we will be hearing Star Wars in a way we've never heard it before. He did not mention if Empire and Jedi would be receiving the same treatment. 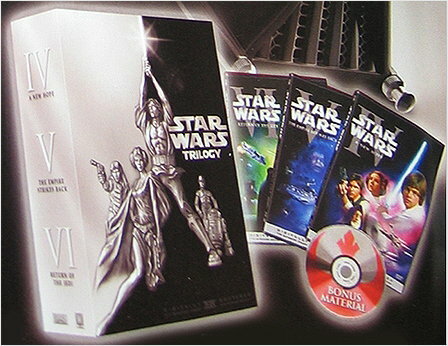 March 21, 2004 (DVD): Lucasfilm will be unveiling the cover art for the four-disc set. It is already available for Hyperspace members to see, but the rest of us will get a look at it on March 22, when it becomes available for pre-order. The discs will come in four keepcases (similar to the Indiana Jones set) housed in a metallic slipcase. 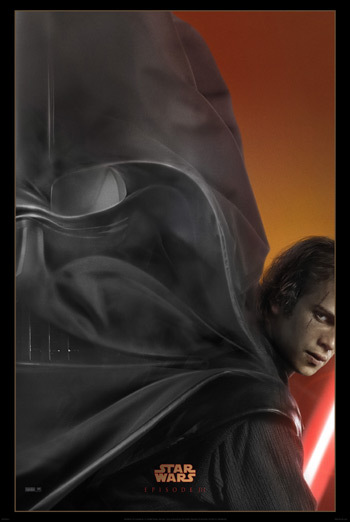 The slipcase will be metallic platinum (widescreen) or metallic gold (pan and scan) embossed on one side with the cast and on the other side with Vader's mask. 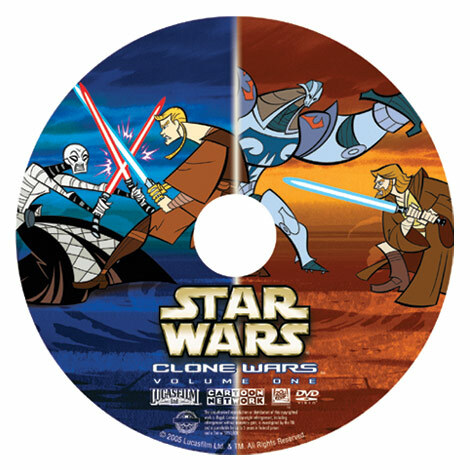 Cover art for the individual keepcases is modeled after the Episode I and Episode II discs. I'll post pictures here when they become available. March 22, 2004 (DVD): As expected, we have pictures of the cover art for September's four-disc set. No pictures of the individual keepcases yet, but here is the box art. Front, back, and first overall views are of the widescreen set. The last overall view is of the gold-colored pan and scan set. March 30, 2004 (DVD): Let the pre-ordering begin... Amazon.com now has the trilogy DVD's available for pre-order. The asking price is $41.99. It is also available from buy.com for $41.98, and both offer free shipping. Expect it to show up all over the place very soon. March 31, 2004 (DVD): A quick update on pre-orders: $61.27 from Deep Discount DVD and $44.99 from DVD Planet. Suncoast has it for $69.98 and Circuit City has it for $69.99, both prices that seemed high enough to make links to them pointless.. Best Buy also has it for pre-order for a more reasonable $49.99, but in spite of the shiny silver cover art they splashed on the front page of the "movie" section of their site, the only set currently available for pre-order is pan & scan -- and that's no better than selling the widescreen set at the $70 list price. I'll keep an eye on them and see if they get it in gear and add the widescreen set to their site. These sound like they could be some interesting commentaries. Bring on September -- I'll have the TV upgraded by then and the system ready and waiting for a weekend movie marathon. April 2, 2004 (DVD): Fourth day this week with an update... Digital Bits has noted some specific details listed at Best Buy's site regarding the contents of the fourth disc in the trilogy set. Best Buy lists the feature-length commentary's title as "Star Wars: The Independent Films" and mentions four featurettes: The Evolution of Characters, The Influence of Star Wars, Lightsabers/Fights, and a 1977 featurette. There's also mention of a "comprehensive gallery of posters and artwork" and a demo for the X-Box game Star Wars Battlefront. Best Buy has also finally added the widescreen set to their site, and after a brief fluctuation in price they have returned to their $49.99 price for both versions. Section One - The Creator: Finally the birth of Vader. George talks about finally bringing Vader back to the series and teases about Anakin's descent to the Dark Side and the powers of seduction in play. Section Two - The Costume: Black is back. For the last Star Wars movie ever and the birth of the ultimate villain, a new costume was forged. This segment answers some key questions: who created it? was it made for Hayden? DVD-ROM Features - DVD ROM link to exclusive Star Wars website. April 9, 2004 (DVD): Digital Bits has reported that the disc four feature list listed on sites like FYE is "not entirely correct"  it is apparently based on an early spec list for the disc. No word on when the official specs will be announced. There's also an interesting tidbit making the rounds, which the Bits believes to be largely accurate, that Ian McDiarmid has shot some scenes so that the holonet Emperor in Empire Strikes Back can be replaced with McDiarmid. They've also been told that the CG Jabba in A New Hope is getting re-done, most likely using the Jabba digital model created for Phantom Menace. April 20, 2004 (DVD): We now have an official press release on the full specs for the trilogy four-disc set. You can read about it here at starwars.com, but here are the salient points: All three movies have been remastered by Lowry Digital in anamorphic widescreen with Dolby Digital 5.1 EX soundtracks and commentary tracks as previously reported. Nothing really new there. The fourth disc reportedly includes ten hours of bonus material, with the feature-length documentary at the core. The documentary (which runs two and a half hours) is titled Empire of Dreams: The Story of the Star Wars Trilogy. There's also a behind the scenes preview of Episode III called The Return of Darth Vader and a series of featurettes titled The Birth of the Lightsaber, The Characters of Star Wars, and The Force Is With Them: The Legacy of Star Wars. Original trailers and TV spots, a production photo gallery with hundreds of images, poster and print campaign images, a preview of the Episode III game (due Spring 2005 on Xbox and PS2), and a demo of the Battlefront game (due September 21 for PS2, Xbox, and PC). 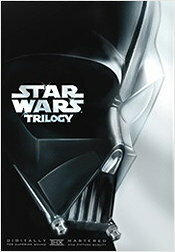 Oh, and you can add one more online store taking pre-orders for the trilogy: StarWarsShop.com for $49.99. When asked if the forthcoming DVDs would feature the original theatrical release versions of the trilogy or the Special Editions, Sansweet answered that the films contained on the discs would be the incarnations of the films "as George Lucas sees them today." He reminded people of the 1995 video release of the trilogy that hailed itself as the last time the original theatrical cuts would ever be available. "They weren't kidding," Sansweet noted. That confirms (1) the original theatrical cut has been banished from Skywalker Ranch (leaving it trapped on old VHS tapes, a few LaserDisc releases, and the hodge-podge of often-dreadful bootlegs) and (2) the version that will be on the discs will likely include some changes above and beyond those found in the 1997 Special Editions. Neither of these represent revelations, as both were either known or heavily rumored to be the case, but this does offer some official weight to the issue. It is sort of interesting that after all the debate online of original cut or special edition on DVD, we are ending up with something that is technically neither. June 18, 2004 (Movies)/(DVD): We've got a bunch of news items today. First, there's some word about possible DVD releases for the Clone Wars cartoon shorts. The first two series (episodes one through ten and episodes eleven through twenty) may be appearing on DVD in the first quarter of 2005. The third series (and possibly a fourth) should air in the spring, leading up to the theatrical release of Episode III next May. These additional episodes will be less numerous but longer (around ten minutes rather than the four or five minute format used in the first two series). There may also be a live-action TV series set in the Star Wars universe appearing in 2006. Speaking of Episode III, we should be getting a trailer this November. Title rumors continue to fly, with one of the latest being "Revenge of the Sith." UPDATE: Less than an hour after I posted the picture above, I got an e-mail with a link to TheForce.net and a second, more extensive image. As with the first, this is purely unofficial. 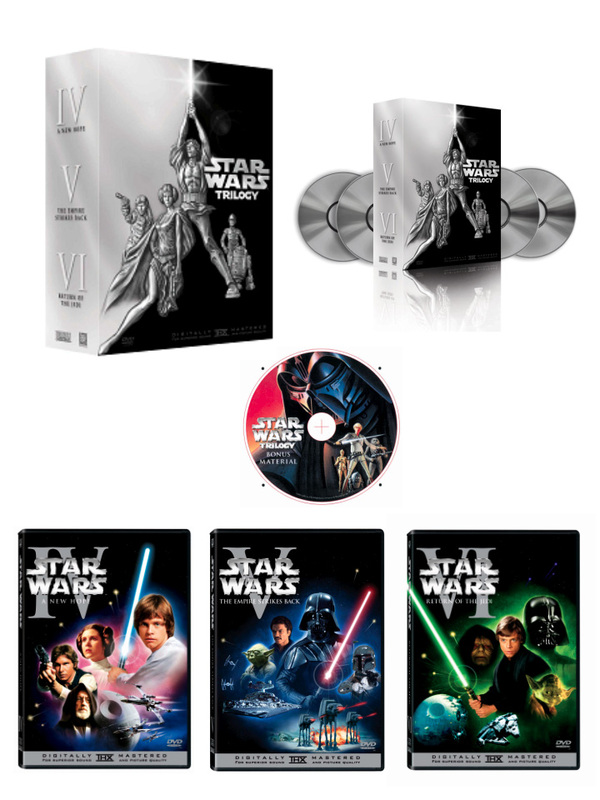 It's interesting to see that only the Episode IV cover appears the same in both pictures, although the silver title lettering and background colors are the same on both versions. I like seeing the Ralph McQuarrie art on the bonus disc; it doesn't match the bonus disc shown in the first picture, but it seems like a more likely candidate for the real disc art than the single-color Rebellion logo. 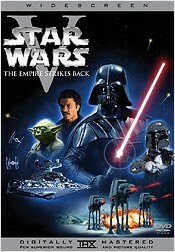 June 25, 2004 (DVD): Lucasfilm has released the final individual box cover art and disc art for the trilogy (to go along with the box art that's been out for some time now). 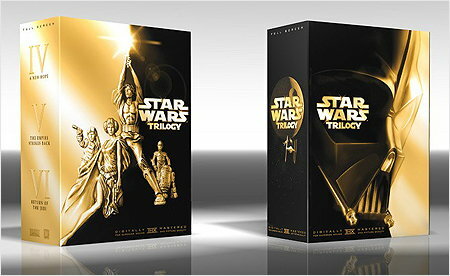 As we saw with the leaked cover art last week, it follows the pattern established by Episode I and Episode II, with the only change being the accent color (silver instead of gold for the widescreen version); I suspect that the pan & scan versions will use the gold accent color from the box art in lieu of the blue used on the Episode I and II pan & scan covers. July 26, 2004 (Movies)/(DVD): Episode III has a title: Revenge of the Sith. Nifty. In other Star Wars DVD news, we can expect to see a slew of DVD's this November and December: the Droids cartoons, the Ewoks cartoons, and both The Ewok Adventure and Ewoks: The Battle for Endor movies. Also, the first twenty episodes of the Clone Wars cartoon series are still due to appear in the spring of 2005. August 25, 2004 (DVD): We've got a new DVD release announcement today: three "double feature" DVD's due on November 23. 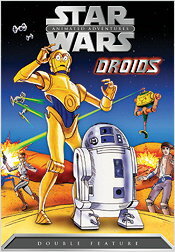 First is Star Wars: Animated Adventures - Droids, which will be a pair of feature-length films ("The Pirates and the Princess" and "Treasures of the Hidden Planet") created from select episodes of the 1985 "Droids" animated series. 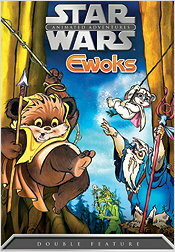 Next is the similar disc Star Wars: Animated Adventures - Ewoks that will contain a selection of episodes from the "Ewoks" animates series (which ran from 1985 to 1987) edited into the feature-length movies "The Haunted Village" and "Tales from the Endor Woods." That's right, at least for now we are not getting full series releases for either animated series. Lastly, Star Wars: Ewok Adventures will put both of the 1984/1985 live-action Endor movies The Caravan of Courage and The Battle for Endor in one package. No word on special features (if any), and with each disc retailing for $14.98 I suspect they are bare-bones discs. Caravan of Courage was originally released theatrically overseas, so it (and possibly the sequel) might show up in widescreen, but the cartoons will certainly be 4:3. As for soundtracks, I would tend to suspect Dolby Digital 2.0 all around, but I might be surprised. Here's a little cover art to round out the announcement. September 9, 2004 (DVD): Lucasfilm unveiled the four-disc trilogy set to the press yesterday, and as a result the reviews have arrived. From all accounts, Lucasfilm, Fox, and Lowry Digital did their jobs well. Bill Hunt of The Digital Bits is highly complementary of the audio and video quality in his review, saying, "Simply put, the Star Wars films have never (and I mean EVER) looked this good before." The transfers are free of edge enhancement and benefit from a massive cleaning of the original negatives that offers better detail than ever before, and the soundtracks are very solid in their newly-remixed Dolby Digital EX form. There are a number of additional revisions on top of the 1997 changes, which are outlined in Hunt's review and focus primarily on A New Hope. Greedo still gets a shot off, but it's apparently less clumsy and timed to coincide almost exactly with Han's shot. The lightsabers are cleaned up, as is Jabba (using the CG model from Episode I) and one scene with Luke's landspeeder. Other changes? The emperor in Empire Strikes Back is now played by Ian McDairmid, and the scene includes some revised dialogue that will likely tie more closely into the events in Episode III. Boba Fett is now voiced by Temuera Morrison (Jango Fett), and Luke's scream was removed from his fall through Cloud City. 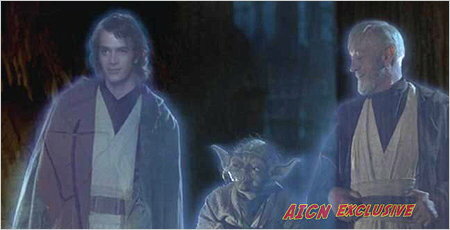 Return of the Jedi gets a few changes, as well. Vader's eyebrows were removed from the scene in which Luke removes his mask, Naboo shows up during the galaxy-wide celebration, and Anakin Skywalker's spirit at the end is in fact played by Hayden Christensen rather than Sebastian Shaw (as previously rumored). Bottom line: I'd still like to see the original theatrical cuts preserved for posterity, but it sounds like the set we'll be getting in less than two weeks will be a worthwhile addition to the DVD library. September 14, 2004 (DVD): There have been a number of reviews for the trilogy DVD's published in recent days, including one from DVD Talk. Between the numerous print reviews, a few detailed online reviews from sources like Digital Bits and DVD Talk, the A&E presentation Sunday night of an abbreviated version of the new documentary "Empire of Dreams," and the DVD commercial that they're running now, there's a pretty good bit of hype building up for next week's release. So far the concensus appears to be that the discs are exceptionally well done, the bonus material is largely excellent, but a fair number of people still sort of miss the original theatrical versions  which is to be expected. I actually find myself looking forward to the release, even in spite of the excessive delay and the revisions. September 20, 2004 (Movies)/(DVD): I've got a couple of items for today (the day before the official release of the trilogy DVD's). Amazon.com has shipped my DVD's, and they are supposed to arrive on Thursday. Decisions, decisions... Watch the CSI premiere in HD, or watch A New Hope? Speaking of A New Hope, The Digital Bits has amended their review of Episode IV's DVD to note a few audio problems that may represent editing mistakes. These can be found in the Editor's note about a quarter the way down page two of the review. Rather disappointing, but we'll see what the Bits hears back from Lucasfilm. Why did Lucas release the trilogy this year rather than waiting until 2006 as he'd originally planned? "Just because the market has shifted so dramatically. A lot of people are getting very worried about piracy. That has really eaten dramatically into the sales. It really just came down to, there may not be a market when I wanted to bring it out, which was like, three years from now. So rather than just sit by and watch the whole thing fall apart, better to bring it out early and get it over with." Or, in a word, bootlegs. Why did Lucas make the changes seen in the 1997 Special Edition and the new DVD's? Because he was never happy with the originals  they never lived up to what he had envisioned. Since he had the opportunity, technical resources, and money, he decided to continue with the editing process. Why will Lucas not release the original theatrical cuts? I'm the one who has to take responsibility for it. I'm the one who has to have everybody throw rocks at me all the time, so at least if they're going to throw rocks at me, they're going to throw rocks at me for something I love rather than something I think is not very good, or at least something I think is not finished." As Lucas says, he's the one responsible for the movies. He gets final say on the matter, whether we agree or not. And from the sound of it, the original theatrical versions of these movies are clearly just a rough draft that he's left behind and has no interest in returning to. Oh, well. September 21, 2004 (DVD): Release day has arrived, and UPS says that my discs should actually arrive today. In somewhat more uncertain news, Digital Bits received a reply from Lucasfilm late yesterday about the audio problems they found in A New Hope (a volume reduction on several segments of Williams' score, some quality problems with Tarkin's dialogue around his line "Then name the system! ", and a reversal of the score in the left and right surrounds): "We are always impressed with how closely fans listen to the many different sound mixes we have made for the Star Wars movies over the years. It is flattering to know that, indeed, the audience is listening. Consequently, each mix comes out differently and any changes that you hear on the all-new Dolby Digital 5.1 Surround EX tracks on the Star Wars Trilogy DVD set are deliberate creative decisions. We can confirm that there are no technical glitches as reported." It will be interesting to see what sort of reactions show up in some of the online home theater forums in the coming week as people get these discs in their systems. September 30, 2004 (DVD): There is an interesting transcript of an online chat with Van Ling at washingtonpost.com. There are a number of pretty hostile questions about the revisions to the movies and the audio mix on A New Hope, which I thought was pretty unfair to direct at the guy who simply took the audio and video transfers from Lucasfilm and wrapped them in a great looking package. Van Ling handled the questions very well  he pointed out Lucas's right to do what he feels is right with the movies, reinforced the widely-held belief that Lucas will probably not change his stance on the original theatrical cuts, and he expressed a sincere fan's fondness for those original cuts. He also made several references to a likely release of all six movies in a feature-loaded box set (which has long been Lucas's goal) and indicated that the likely release window for that set will be 2007 for the 30th anniversary of Star Wars. Also, some people have encountered a problem that looks to be related to a mistake in pressing some of the A New Hope discs: the disc freezes for a few seconds (apparently near the layer switch point) and then skips ahead several minutes. Fox Customer Service is taking names and addresses of people affected by this problem and will be sending them a replacement disc. If this affects you, give them a call at 888-223-2FOX. November 4, 2004 (Movies): The teaser trailer for Revenge of the Sith is now available to Hyperspace subscribers. It will also be available at the front of most prints of The Incredibles tomorrow, and will be showing up on a few TV programs around the world in the next few days. The trailer will be available online to anyone on Monday, November 8, at starwars.com. I got a look at the high resolution Quicktime file that Hyperspace members can get today, and it really is a fun minute and 45 seconds. If you are interested, here's a summary  just highlight the text below to see the trailer spoilers. The first 45 seconds is a series of video pieces from A New Hope, Phantom Menace, and Attack of the Clones as we hear Obi-Wan's speech from A New Hope explaining Vader's turn to the dark side and the fall of the Jedi. After that, we get a glimpse Anakin with some really weird "I'm evil now" yellow eyes; a little landscape from the volcanic world where Anakin/Vader and Obi-Wan will duel; Vader immediately after being rebuilt as the black-armored baddie we know and love interspersed with short appearances by Obi-Wan, Padme, Windu, Chewbacca, Yoda, and both droids (and it's worth noting that none of them looked particularly happy with their different situations); a number of brief but very promising action sequences (some really massive space battles, an army of Wookiees, a little combat between Obi-Wan and Anakin, both Yoda and Windu with sabers drawn, two scenes of Padme with Anakin, and a nasty looking Sith  possibly Sidious  swinging a red-bladed lightsaber); and glimpses of some spacecraft that will tie in nicely to the original trilogy (including Jedi Starfighters with some early TIE Fighter canopy designs, a predecessor to the X-Wing that is apparently called the ARC 170, and what looks like a Dreadnaught class ship as used in some of the Expanded Universe novels). If you get impatient for Monday and can't make it to see The Incredibles tomorrow, here's a link I just found at Penny Arcade. December 6, 2004 (DVD): It's been a couple of weeks since Lucasfilm turned loose three additional DVD's from the Star Wars universe, and their arrival was as much unnoticed as the Trilogy set was frantically publicized back in September. I went hunting around today and found almost no reviews of these discs. Coming Soon! did post reviews of all three discs, however: Star Wars Animated Adventures - Droids, Star Wars Animated Adventures - Ewoks, and Star Wars Ewok Adventures - Caravan of Courage / The Battle for Endor . It looks like all three titles are bare bones only, with no extra features to speak of, which isn't really a surprise considering their stealthy release and low price. 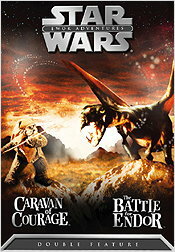 The live action "Ewok Adventure" movies are presented in 1.33:1 aspect ratio, even though at least Caravan of Courage was shown theatrically overseas; since the primary presentation format for both movies was 1980's television, I can accept that 1.33:1 could be considered the original aspect ratio. As previously stated, the two animated discs are not comprehensive collections of the two animated series. Instead, each disc contains two feature-length "episodes" assembled from a few related episodes from each series, a format that was put together for a VHS release in the 1990's and simply recycled here. There are no official plans to revisit either series with the sort of comprehensive season-by-season treatment given to other animated and live-action TV series in recent years. None of these discs are enough to grab my attention much (or my wallet), but they are out there and available for less than $12 each from Amazon.com. I'll even give you direct links for anyone interested in a little Star Wars-themed Christmas shopping: Droids, Ewoks, Ewok Adventure. Happy holidays, folks  Santa's only three weeks away, and Revenge of the Sith is less than five months behind him. December 7, 2004 (Movies)/(DVD): After yesterday's tidbit about new DVD's, we have a little more today. Starwars.com has officially announced that volume 1 of the animated series Star Wars: Clone Wars will arrive on March 22, 2005. This will include the first twenty episodes (19 three-minute episodes and one five-minute episode). The second wave of episodes will premiere on Cartoon Network on March 21, 2005. January 18, 200 (DVD)5: Last year was a very busy one for Star Wars DVD news and events, and yet Episodes I and II were not available on DVD during 2004  they were placed on indefinite moratorium on December 31, 2003. Both discs will be returning to store shelves on March 22, 2005, however. They will be joining the previously announced Clone Wars animated DVD arriving that day as part of the marketing blitz for Revenge of the Sith. January 28, 2005 (Movies)/(DVD): March 22 is less than two months away (and with it the Clone Wars DVD and the re-issues of Episodes I and II). In preparation for that, Lucasfilm has released some more details about the disc. It will be widescreen (presumably anamorphic) with English, Spanish, and French Dolby Digital 2.0 audio (the lack of Dolby EX or at least Dolby 5.1 is a bit surprising to me). Bonus features include a featurette looking at the ties between Clone Wars and Revenge of the Sith, a behind-the-scenes featurette, the Episode III teaser trailer, concept art, and two commentaries. They also released some art from the disc, which you can see below. In other Star Wars news, starwars.com has a page with the opening text crawls from all six movies, including Episode III. It's an interesting tease, which I've reproduced below. If you can't wait until May to read it, just highlight the text above. 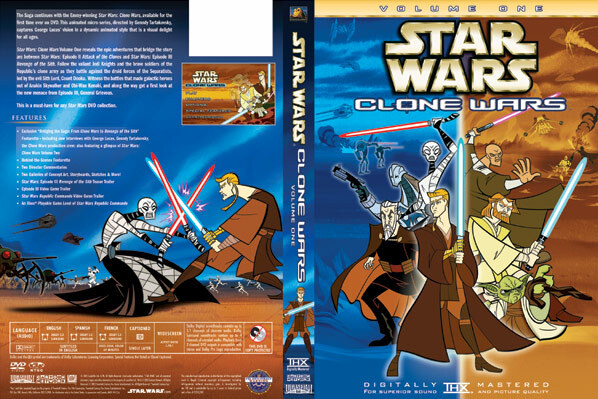 February 4, 2005 (DVD): There's a review up at The Digital Bits for the Clone Wars DVD. February 24, 2005 (Movies): I've got two tidbits this morning. First (and most official), expect the final trailer for Revenge of the Sith to show up at the front of Robots on March 11. Presumably it will show up online at around the same time as well. Second, reader Liron Barzilay sent me this link that he found recently to a page with an outline of Episode III in stills along with a few notes explaining the action. I don't know how accurate it is, but it does look interesting. It is very spoiler-heavy, though, so stay away if you are trying to avoid spoilers. Another reader also passed along this even more detailed spoiler page for those who are interested. March 1, 2005 (Movies): In addition to appearing in front of Robots on March 11, the final trailer for Revenge of the Sith will also show during "The O.C." on Fox on March 10. April 24, 2005 (Movies)/(DVD): There's some DVD news coming out of Celebration III this weekend. Lucas made several interesting comments. First, the all digital version (which will presumably used to create the DVD transfer) is slightly longer than the film print  he specifically mentioned a Dagobah scene that will not be in the regular theatrical prints. Lucas also mentioned two TV projects: the ongoing animated Clone Wars series from the Cartoon Network and a live action series. He will not be doing addional movies, however, so there won't be episodes 7, 8, or 9. There are plans for a six-disc box set containing all six movies, possibly with a seventh bonus disc that would include deleted scenes from the original trilogy. 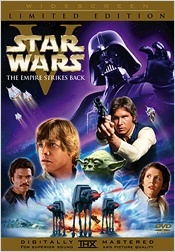 This box set would use the existing DVD edits of all six films  when asked about additional changes to the films, Lucas said that the films are now the way he wants them. There appear to be no plans for an high-definition disc release of the movies in 2007, as some people have theorized. (In light of recent rumors about negotiations between Sony and Toshiba to merge Blu-Ray and HD-DVD and avert a potentailly disasterous format war, I'm not even sure what high definition format might be available in 2007.) Lastly, Lucas reiterated a new desire to re-release the original trilogy to theaters using the new 3D technology. April 27, 2005 (Movies): Penny Arcade offers a great cautionary word about the potential pitfalls of a live action Star Wars TV show in today's comic. While the idea of a well-implemented Star Wars series is very appealing, the dangers of a painful mis-step are undenyably worrying. June 8, 2005 (DVD): This last few weeks has seen a lot of traffic on the site (particularly the DVD covers and reviews), presumably due to the release of Revenge of the Sith and the reports of bootleg DVD's. Today, though, we've got some real DVD news to report. 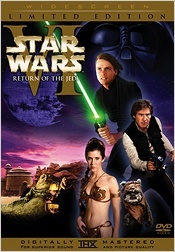 A report on TheForce.net indicates that there will be six different DVD releases on November 1, 2005. First, there will be widescreen and full screen versions of Revenge of the Sith, both of which will presumably be two-disc releases following the pattern set by Phantom Menace and Attack of the Clones. In addition to this, however, there will also be widescreen and full screen box sets of Episodes I through III and widescreen and full screen box sets of Episodes I through VI. None of this is official yet, and there are a lot of details missing (number of discs in each package, features to be included, whether there are any revisions to the movies, whether there are new transfers for any of the discs  such as the Phantom Menace disc that caught grief for edge enhancement when it was released several years ago). The assortment of offerings make sense, though, as does the timing: just in time for the holidays. If this is real, we should be seeing some official word from Fox and Lucasfilm in the next couple of months. July 5, 2005 (DVD): No new official word on the Revenge of the Sith DVD, but there are some rumors circulating that we may see an official announcement of release date, cover art, and possibly even feature list for the disc. The anticipated release date remains November 1 or possibly November 8, with both anamorphic and pan & scan versions. Also expected is some word on a box set containing all six movies that will likely be released on the same day. July 25, 2005 (DVD): We have a bit of a rumor-based update this morning. There was supposed to be an announcement about the Revenge of the Sith DVD at the San Diego Comic-Con a couple weeks ago, but that was scaled back to a few hints because they are reportedly still hammering out some of the special features. It is very possible that one of those features will be a deleted scene set in Bail Organa's office with Padme and a young Mon Mothma  a meeting that could represent the birth of the rebellion. When it comes to release dates, we now have two rumors. First, Revenge of the Sith will most likely appear on November 1, although there have been a few hints lately that November 8 may be the day. Volume Two of the Clone Wars cartoon should also be arriving this fall. Early suspicions were that it would hit on the same day as Sith, but the latest news suggests that it will arrive on December 6, presumably to make sure it hits shelves before Christmas but doesn't get in the way of the Episode III release. A six-disc box set of Episodes I-VI is probably unavoidable, but it looks like it will not appear this year. July 26, 2005 (DVD): And hot on the heels of yesterday's news item, we have something official to chew on. Episode III - Revenge of the Sith will arrive on DVD on November 1, 2005. It will be a two-disc set, although a full list of features is not yet available. Features on the first disc include anamorphic or pan-&-scan video (available separately) transferred directly from the original digital master and Dolby Digital EX audio; no word yet on a commentary, but it would be shocking if one were not included. The second disc will include a feature length documentary and two featurettes (one looking at the prophecy of Anakin Skywalker as the Chosen One and one looking at the movie's stunts). The web documentary "Making Episode III" will also be included, as will a two-level playable demo of the game Battlefront II. There's no mention that I've seen whether the demo will be for XBox, PS2, PC, or more than one of those platforms, but The Digital Bits did some digging and has reported that the demo will be for the XBox. Below is a preview of the cover art for the widescreen version. There is still no official word on a DVD release of the second volume of the Clone Wars cartoon or a complete six-movie box set. The Clone Wars disc should be announced in the next couple months to hit a holiday release date (most likely the December 6 date reported by The Digital Bits), but the six-movie box set is a bit more mysterious. It's entirely possible that Lucas will wait for the 30th anniversary of A New Hope in 2007 for such a box set, which would both give them time to put together new material (possibly even new transfers, at least for Phantom Menace) for the box set and serve as a handy marketing ploy for the proposed 3D theatrical re-release of the original trilogy that Lucas has expressed hopes of kicking off in 2007. August 9, 2005 (DVD): Episode I and Episode II re-appeared on DVD just before Episode III arrived in theaters earlier this year. Well, The Digital Bits is reporting that they are being re-released again at an MSRP of $19.98 at the same time that the trilogy box set is re-released at an MSRP of $69.98. Both re-releases are scheduled for November 1, the same day that Episode III arrives on DVD with an MSRP of $29.98. These prices match those already listed on Amazon.com, where all three titles are available for immediate delivery. As far as I can tell, these "re-releases" are actually just cross-promotions, as none of the titles appear to have pulled from the shelves as of today (less than three months before the announced "re-release" date) and all are already listed at the same MSRP's. By the way, Sith is available for pre-order from Amazon.com for $15.98. August 29, 2005 (DVD): In an interesting bit of role-reversal from Episode I's original VHS-only release in the fall of 1999, Revenge of the Sith will arrive on DVD only this November  there will be no VHS release for Episode III. Symbolically, it's a pretty meaningful event for the DVD format. VHS has been on the way out for several years now, though, so I doubt that the absence of Sith on the format will have any particularly meaningful impact. September 6, 2005 (DVD): We have another official Star Wars DVD announcement for this holiday season: Star Wars: Clone Wars  Volume Two will be released on December 6. The disc will include the five 12-minute episodes of Clone War's second season in anamorphic widescreen and Dolby Digital 2.0 plus an assortment of extras (featurette "Connecting the Dots" dealing with the creative process and ties to Episode III; two galleries of concept art, storyboards, and sketches; trailers for the video games "Star Wars: Empire at War" and "Star Wars: Battlefront II;" and a playable two-level XBox demo of Battlefront II). No word yet on price. September 21, 2005 (DVD): I've got a quick update today regarding the Revenge of the Sith DVD. Wal-Mart will have an exclusive package of the two-disc set and a bonus disc. The bonus disc will have almost 60 minutes of content, which appears to all be contained in "R2-D2 & C-3PO's Chronicles Of Luke And Anakin Skywalker." The price is $25.48 (MSRP is $29.98, but with only Wal-Mart carrying it it's a bit humorous to see "their price" saving you $4.50). Personally, the combination of my dislike for Wal-Mart and the cost for the added content (about $10 more than a pre-order from Amazon.com or other site for a potentially cheesy 60-minute documentary) aren't enough to steer me to Wal-Mart's doors on November 1. September 28, 2005 (DVD): Work's pretty crazy at the moment, but I wanted to take a minute to post a couple news items. First, Fox has announced that they will be re-packaging the original trilogy SE discs issued last year in a three-disc set (no bonus disc) on December 6 (the same day volume two of Clone Wars arrives). This set will be available in widescreen or pan-and-scan, and (it's important to make clear) is the same as last year's set minus the bonus disc. In addition to this news, we have an update on the extras for the Episode III DVD. I've compiled it as best as I can below along with other specs, some of which come from earlier announcements. Playable two-level Xbox demo of "Star Wars: Battlefront II"
trailer of "Star Wars: Battlefront II"
Digital Bits has also hinted that they expect to get their hands on a copy of the DVD set soon. With the release data just over a month away, we should start seeing online reviews appearing within two or two and a half weeks. September 29, 2005 (DVD): I've got a quick follow-up to yesterday's news post. The folks at Ain't It Cool News have posted a collection of pictures from some of the deleted scenes that will be on the Episode III DVD. There are eleven pictures in all, covering some extra scenes with Grievous (including the death of Jedi Shaak Ti), a bit more of Obi-Wan and Anakin, and Yoda's arrival on Dagobah. I've taken a moment to mirror the images here for your convenience. October 24, 2005 (Blu-ray): I was starting to put together some notes for a review of the Revenge of the Sith DVD (which will be arriving at my house one day next week) and came across an interesting tidbit in a review of the Sith DVD by DVD Review. Apparently, Lucasfilm is planning to release all six movies on Blu-ray (Sony's entry into the HD optical disc format war, and the format that currently has a wide lead in studio support) once the format launches. The Blu-ray format launch should hit the US around mid-2006 (Sony's Playstation3 will support playback of Blu-ray movie discs when it is launched in the spring of 2006, much like PS2 and Xbox currently support DVD movie discs). It will be interesting to see what becomes of Lucasfilm's plans in the next year or so, especially with this early announcement focusing specifically on Blu-ray and not touching on HD-DVD at all. I'll keep an eye out for more news on Blu-ray Star Wars discs. May 3, 2006 (DVD): Well, I'll be damned... In an act that should well and truly bring an end to bootleg collecting and home-brew LD-to-DVD transfers, Lucasfilm has announced that they will release the original theatrical versions of A New Hope, The Empire Strikes Back, and Return of the Jedi on DVD on September 12, 2006. It will disappear from shelves on December 31, but that's OK  the folks that want it will have it on their own shelves by then. Here's the full run-down (at least so far): there will be three separate two-disc sets, one for each movie, with both the original theatrical release and the Special Edition version on separate discs for each movie. The SE versions will presumably be the same transfers released in 2004 (in case you didn't have them, I suppose). The original theatrical releases will sport Dolby Digital 2.0 soundtracks and will go all the way back to the original theatrical runs  which means the opening scroll for A New Hope won't even have "Episode IV" in there, Han will waste Greedo before the green guy even tries to get a shot off, the X-Wings and Y-Wings attacking the first Death Star will still be stop-motion, and Jabba's band will once again perform "Lapti Nek" as their sole musical number (with a good deal less seizure-inducing thrashing around than was found in the song added to the SE). Obviously, this is a pretty remarkable move on Lucas's part  he's spent nearly a decade now declaring the original theatrical cuts to be nothing more than discarded early drafts of the final movies and steadfastly focusing on the Special Editions as the final (and, indeed, only official) form of the three movies. Many fans continued to be loyal to the original versions, and those fans have clamored for an official release of those versions on DVD. It's interesting to note the timing of all this, too. When I started this page back on 2001 or so, Lucas had stated his intention to keep all six movies off of DVD until he could release a six-movie box set in 2006  that plan would have seen no Star Wars DVD's on the market today. Fan uproar finally convinced him to release Phantom Menace on DVD in 2001 (over two years after its theatrical release and four and a half years after the format launched), followed a year later by a DVD of Attack of the Clones that arrived simultaneously with the VHS. 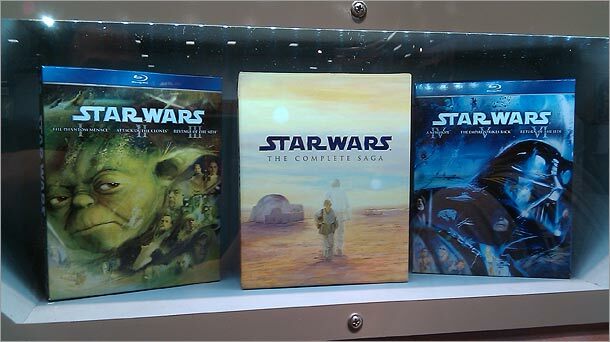 Even then, Lucas was determined to hold the original trilogy until this year, but ongoing fan pressure coupled with a thriving bootleg DVD industry (and perhaps some recognition of the potential for profit) finally changed that and 2004 brought the Special Editions to DVD. 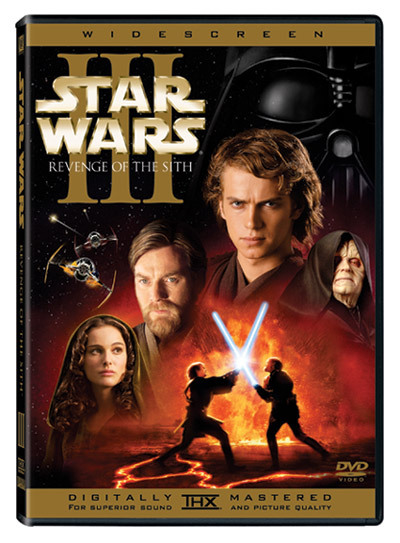 Many fans continued to grumble about the SE's revisions, and not even the arrival of the Revenge of the Sith on DVD in 2005 (with no VHS version even offered) did little to change that. Now here we are, in the year that was supposed to bring the first Star Wars DVD's to market (a scheme that would have looked pretty silly with the DVD format more than nine years old and the Blu-ray/HD-DVD format war kicking into gear), and we're getting the one thing that many of us never expected. I'm sure we'll hear more in the coming months, and I'll keep track of it all here. 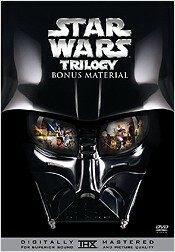 May 17, 2006 (DVD): Lucasfilm has released cover art for the Limited Edition Original Trilogy DVD's. Pre-orders are supposed to have started on last Friday (May 12) at StarWarsShop.com, but they may have meant this Friday (May 19) since I saw no sign of them when I checked today. There was no other new information released. Each movie will still include one disc with the Special Edition version (all indications are that these will be the exact same discs released in 2004, although they may change the art on the faces of the discs) along with a disc for the original theatrical version. Since the original theatrical discs will include only Dolby Digital 2.0, the audio tracks and video transfers are most likely being drawn from the masters produced for the 1993 or 1995 LaserDisc sets. How much restoration (if any) will be involved remains a mystery, and there's no word yet on what sort of extra features will appear on the original theatrical versions. Commentary tracks were included in the old LaserDisc releases and could be recycled for these DVD's, or they could produce new commentaries. There were also still photo galleries, trailers, interviews, and a few featurettes included on the 1993 Definitive Edition LaserDisc set, not to mention a ton of other content that is lying around the LucasFilm vault (audition tapes, deleted scenes, and so forth) that we've seen very little of. Since there are no separate "bonus" discs announced for these Limited Edition releases and Lucasfilm has previously only offered significant supplemental material on separate discs, I doubt we'll get much more than the movies and perhaps a commentary track for each. May 18, 2006 (DVD): The Digital Bits has confirmed today that the transfers being used on the original theatrical discs will be the 1993 masters created for the "Definitive Edition" LaserDiscs. There will apparently be some digital clean-up, and the transfers will be better than the ones generated by bootleggers using the DE LaserDiscs (although it will be interesting to see how close some of the most resourceful bootleggers got to what will be on these discs). Bill Hunt posted a lengthy rant this morning about the subject. He posited two theories as to why Lucas would choose to recycle a 13-year-old transfer. One theory is that they simply aren't going to spend the money to track down a good print and have a new anamorphic transfer made, instead choosing to use this old LaserDisc transfer to make a quick buck off the fans. If the slap-together discs then failed to sell well, Lucas could simply say that interest in the original theatrical versions is too small to warrant further effort. A second theory is that the restoration effort in 1997 made making a new transfer of the old versions impossible. It seems that Lucas cut the original negatives to edit together the Special Edition versions of the movies, and at the same time he recalled all the release prints of the old versions and had them destroyed. That means the only ways to get to the original versions on film (necessary to generate an anamorphic transfer) would be to either track down the original interpositive prints (whose current condition and whereabouts are not known to anybody outside Lucasfilm) or track down some of the dye transfer prints that exist in the hands of private collectors and film archives. The original interpositive film elements may of course have been destroyed (highly unlikely, but not necessarily impossible) or deteriorated too badly to recover (somewhat more likely, although a restoration effort similar to the 1997 work could certainly achieve wonders), but even then there are any number of sources outside Lucasfilm and Fox that would likely be willing to loan them original prints for use in producing a new master. The likelihood that producing a new anamorphic transfer of the old versions is simply impossible would seem to be very low, which means the decision to recycle the 1993 transfer would be motivated solely by greed. August 24, 2006 (DVD): First, the official news: Lucasfilm has posted screen shots from the menus for the A New Hope "Bonus Disc" arriving next month. 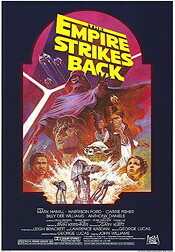 The menus are based on old poster art, but otherwise use a similar format to the previous Star Wars DVD's. Next, the less official (but still not surprising) news: Since next May is the 30th anniversary of the original release of A New Hope, it should come as no surprise that we're seeing reports from several sources (including Digital Bits) that Lucasfilm has plans for a fancy, feature-laden, re-remastered six-disc box set of the entire series (Episodes I through VI). There's no word whether or not we'll see properly remastered versions of the original theatrical cuts in the box set, although I personally doubt there's much chance of that. September 8, 2006 (DVD): We're four days away from the arrival of the Limited Edition DVD's, and the latest tidbit I've seen crop up is an exclusive box set of the three movies in a tin from Best Buy for $60. September 14, 2006 (DVD): It's been two days since the Limited Edition DVD's officially arrived, and there's been fairly little noise surrounding the release  not surprising consdering the dubious nature of the transfers provided for the original theatrical cuts on the "bonus discs." Bill Hunt at Digital Bits did post his review of the discs this afternoon. His conclusion is that the discs seem to do the most that could be done with the 1993 transfer, but that they're still 13-year-old non-anamorphic transfers. My copies arrived from Amazon.com this afternoon, so I'll start tinkering with them in my Oppo 971 soon. It'll be interesting to compare it to some of the Definitive Edition bootlegs I've reviewed in the past. October 5, 2006 (DVD): So what significance might "2007" hold for the concept of Star Wars? Thirtieth anniversary, perhaps? And what does that mean for Lucasfilm's marketing strategies? How about another re-issue of the Star Wars DVD's? TheForce.net has posted a story citing a recent LEGO 2007 catalog (specifically one for the European market) that refers to a planned 30th anniversary DVD release. Translation of the relevent bullet point reads: "The STAR WARS DVD set, that will be released at the 30th anniversary, will be responsible for an increased sale of the new sets. There will be a anniversary logo on all LEGO Star Wars sets." That's pretty vague, of course, but it does provide some semi-official description of a DVD release planned for (if we take "released at the 30th anniversary" literally) May 2007. October 10, 2006 (Movies), (DVD): There are two news items today. First is an interview at MTV in which George Lucas discusses his current projects, including the upcoming 3D computer animated series set during the Clone Wars (between Episode II and Episode III) and the live-action TV series that Lucas plans to begin developing in 2007. The TV series will be set between Episode III and Episode IV and will not focus on the major movie characters. Instead, it will focus on background characters such as the TIE Fighter and Rebel pilots that we met just peripherally in the movies. In unrelated news, TheForce.net posted a news item yesterday about a set of new custom DVD covers for the Limited Edition DVD's. The covers were created by Untamed Cinema and can currently be found by going to "Junk Box" and moving across the junk box until you see an image of Artoo. The news item was updated later in the day to include a link to my cover art, as well. July 16, 2007 (Blu-ray), (HD-DVD): It's sort of news and yet not news, but we have some reports from attendees of this past weekend's European "Star Wars Celebration" event that Rick McCallum commented on the plans for releasing the movies on an HD format (either Blu-ray or HD-DVD). He said that no such release would take place until one format had emerged as a clear winner  suggesting that the movies would be released in HD, but not any time soon. February 20, 2008 (Blu-ray), (HD-DVD): I haven't had a reason to post any news here in quite some time, but in light of this week's huge format war announcements it seemed appropriate to check back in. This will be the last entry with any reason to mention HD-DVD, since the format has officially been abandoned by Toshiba as of February 19, 2008  in the process handing the format war victory to Blu-ray. Based on Rick McCallum's comments last summer, that leaves the door open for LucasFilm to start thinking about releasing the movies on Blu-ray at some point. I would not expect any activity along those lines until Blu-ray adoption has broken a few more milestone figures (probably at least 5 million players, maybe more), profile 2.0 players are widespread and stable, and some more experience has been accumulated in disc mastering for the format. With the impending arrival of a new Indiana Jones movie this year, LucasFilm may use that movie as a testing ground for Blu-ray disc development. It's likely to be either the 2009 or 2010 holiday season before we have much chance of seeing the Star Wars movies on shelves, though. August 23, 2008 (DVD): Some of you may see news or ads for a new DVD release of all six movies on November 4. There's a six-disc package for the original trilogy and a separate six-disc package for the prequel trilogy. Note that there is no new content included in these packages. 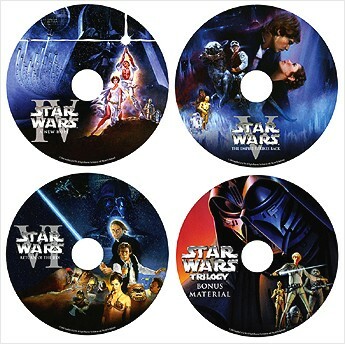 The original trilogy set is the same as the Limited Edition discs released a couple years, and the prequel set is the same as the two-disc releases for each individual movie. Nothing new, and no word of possible Blu-ray plans. Q: Is there any talk whatsoever, and I'm not even going to ask for a date because I know that's ridiculous, but is there any talk about the Star Wars movies on a high definition format? A: Yeah. I mean obviously we've been looking at that for a couple of years and I think one of the questions is when is the market penetration there and these days, will there be a market penetration before everything goes streaming? But we've been looking at an ultimate box set of the Star Wars movies, all six of the movies. And what special features would be. And clearly these days, if you did an ultimate box set and didn't do it in HD, Blu-ray, it just wouldn't make any sense. So now it's a matter of thinking okay, we've been thinking about this for a while, we know what kind of assets we want to use, we've done some work in cleaning up things, it's really a matter of making that decision of when's the best time to release it. Do you wait and have an event because you're working off of the fact that there's going to be a new live action TV series? All those things are very much in motion. I can say with pretty good confidence that at some point in the next several years there will be a complete set of Star Wars movies and lots of extras and deleted footage and anything anyone could want. Although I say that with some trepidation now because our fans want everything, "Why the Holiday Special wasn't on there, you ruined my life!" But in the next few years there will be an ultimate box set and certainly a Blu-ray set. It sounds like we can expect a box set on Blu-ray that would have all six movies and a healthy load of bonus material, but it is likely to be something like 2010 (when the TV show is currently expected to arrive) or 2011. That gives Blu-ray time to have at least one holiday season with $100 players on the shelves at Wal-Mart, so market penetration for the format should be approaching a level that could support some nice, big sales numbers. "We have been at work for a couple of years working on—I won't call it the Ultimate Set because we keep finding stuff—but, a very full set of all six movies on Blu-ray with lots of extra material. We're finding all kinds of scenes from dailies that have never been seen before. Beyond all of those things that you know about… there are some real treasures." He also said, "We're not ready to announce exactly when it's coming out, but it won't be in the too distant future." Whether that means this year, next year, or some time farther out, nobody knows. Certainly Lucasfilm has historically targeted the holiday shopping season with late October releases, so the two most obvious release dates would be late 2010 or late 2011, depending on how much work has been done and how Sansweet and Lucasfilm define "distant." With player prices already low enough that ~$100 decks should be easy to come by this fall, it could be a good time to roll the series back out. A tie-in with the debut of the live-action TV series would also make sense, which could still be either fall 2010 or fall 2011. August 14, 2010 (Blu-ray): Well, it's official - George Lucas has announced at Celebration V that all six movies will be released on Blu-ray as a box set in 2011. These will include the final version of the original trilogy (no original theatrical cuts) as well as some never-before-seen deleted scenes, including one of Luke building his new lightsaber at the beginning of Return of the Jedi. According to the New York Times article, the release will be in the fall of 2011. Expect a release in early to mid-October, much like all the previous DVD releases.